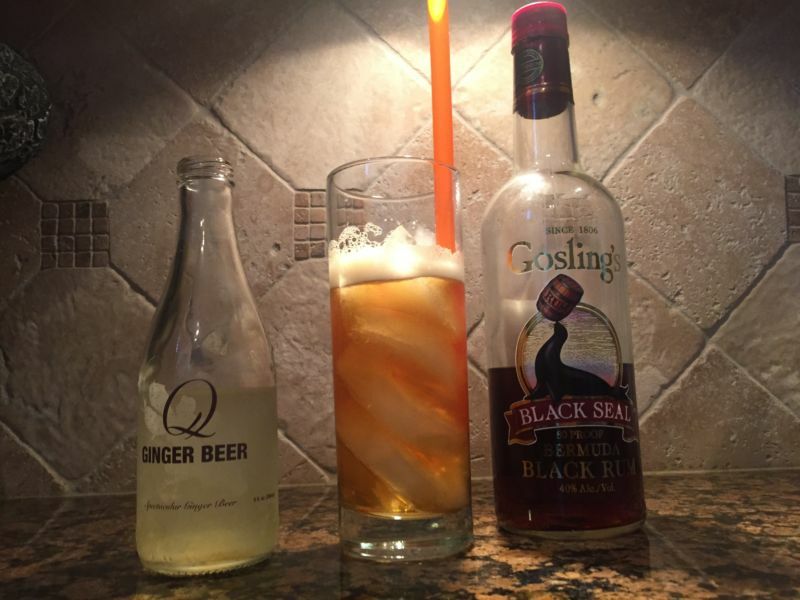 The Dark ‘n Stormy is a highball cocktail that consists of rum and ginger beer. That last sentence may seem factual, but it is an inaccurate statement; at least here in the US. 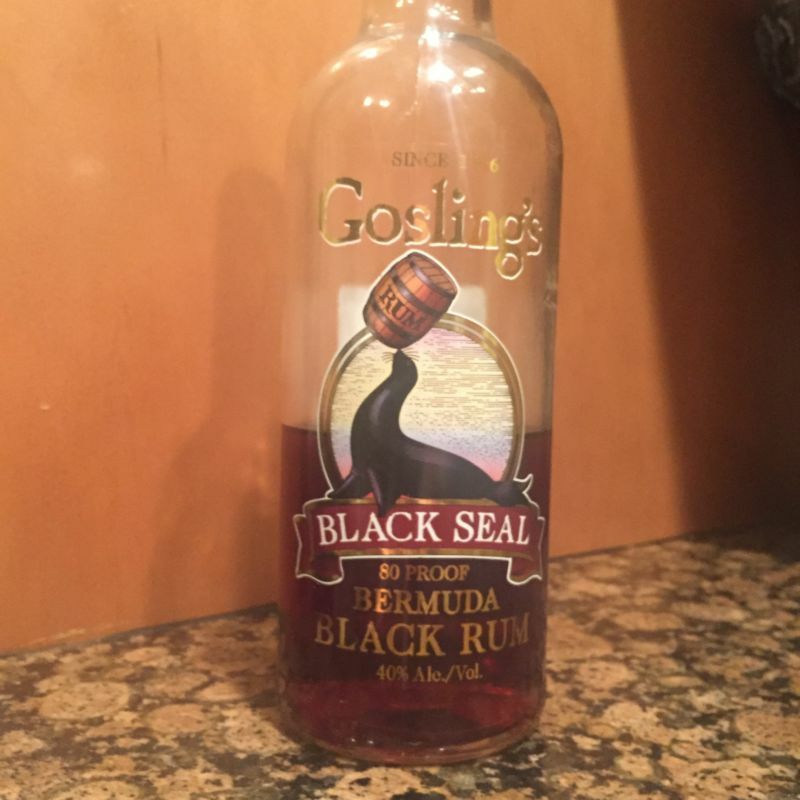 The name Dark ‘n Stormy is a trademark of Gosling Brothers and to make the cocktail you need to use Gosling’s Black Seal Rum; not just any old rum. I cannot think of any other cocktail recipe that proscribes a specific brand of a base spirit; certainly not for a drink that is so commonly available in bars. Place ice in a highball glass, add the rum, top with ginger beer, and stir. Garnish with a slice of lime. Note that ginger beer is not the same drink as ginger ale. The latter is easier to find in the US, but is definitely not the drink you want. The rum’s label may show a black aquatic mammal, but the name comes from black wax that was used to seal the bottle in its original nineteenth century form. Now the bottle has a more conventional plastic screw top; the top is not even black. Dark rum can get its color either from being aged in oak casks or by the addition of colouring in the form of molasses or caramel. I have not been able to determine which method is used by Gosling’s. Ever the pedant, I have a bottle of the required rum, used almost exclusively for making this drink. The recipe does not call for a specific ginger beer, although Gosling’s do have their own brand. The trademark uses a single apostrophe (Yes, I checked the US Patent Office) , although several websites write it as Dark ‘n’ Stormy, use an ampersand, or write the word “and” in full. Even the website of the New York Times uses the first incorrect style. What is the world coming to when the US newspaper of record makes such a terrible error. I have no idea if using either of these forms on a menu would protect you from a trademark infringement if you used a different brand of Rum.